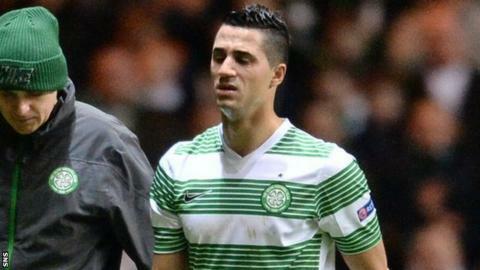 Celtic midfielder Beram Kayal will be out for six to seven weeks with a broken bone in his foot. The Israel international picked up the injury in the in Glasgow on Tuesday. Celtic manager Neil Lennon said: "Beram Kayal has broken a bone in his foot. "So he is going for a CT scan today to see if it requires a screw putting in. He will be out for six or seven weeks with that." Lennon was speaking ahead of Sunday's Scottish Cup fourth-round trip to face Hearts at Tynecastle.